Founded in 1994 by Henri Seydoux, Parrot is a drone company that is all about fun and features. It may not be the fastest or greatest photography option, but Parrot always knows how to stand out. The new Parrot Anafi is another great example of a mainstream drone with style. We got our hands on one and have run it through various performance tests. There are a few quirks, but for the most part, this drone is setting the bar high. Let’s dive into this exciting new release and find out if it lives up to the hype. The Parrot Anafi is a small drone, and it compacts for easy travel. It’s equipped with a 4K camera with HDR capabilities. You also get a lossless digital zoom with 180 degrees of tilt. We spent a few hours testing this camera out and we can say that the two-axis (mechanical) gimbal is truly interesting: why does Parrot only stabilise two and not three axis mechanically? Well, the results are smooth, you can hardly question that, but only as long as you’re not moving the drone suddenly. The camera features a zoom: up to 1.4x in 4K or even up to 2.8x in Full HD. The zoom is, for a drone that costs less than 1.000$, promising, it works well and let’s you get creative! Another marketed feature of the Parrot Anafi is the 180-degree tilt. What is really cool is the upwards facing camera. DJI cameras, for example, can be titled up only a bit and if you do so, you’ll end up seeing the propellers. With this point, the Parrot Anafi clearly excels. The general built-quality though is – let me call it modest, but you at least have various smart-modes that help you get your shots with finesse. You have lots of options, such as Orbit, waypoint, Dolly Zoom, Hyperlapse, and Slow Motion to go with the standard auto-follow. First, the drone that I got for my review was not flyable, it was dead. The second one I got had the propellers screwed onto it the wrong order, which made it flip and die. That says a lot about their QC! One of our favorite things advertised with the Anafi was being able to hold it in your hands and watch it lift off. This makes impromptu filming much easier, as you don’t need to bring a separate controller with you. 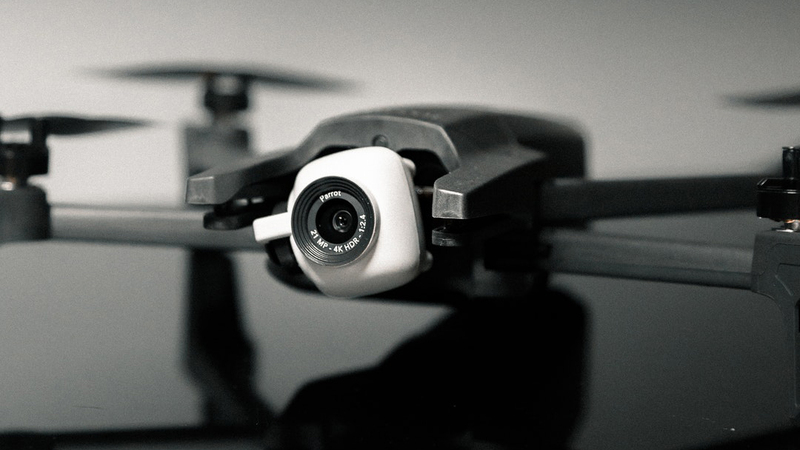 The overall built quality is low, compared to other drone manufacturers. That is to say that you already have some beginner skills piloting drones. Because it is a compact and lightweight drone, you’ll need to be able to judge the wind with some degree of accuracy. Filming in windy conditions is a bit of a struggle. The anti-vibration and stabilization of the camera try to keep up with conditions. At some point, we did run out of battery, but it seemed like we got around 20 minutes per flight. Depending on how windy it is, your mileage may vary. Well, that’s the quick and dirty on the Parrot Anafi. The final verdict for us, factoring in the $600 price tag, is that the Parrot Anafi was released a year too late, but it has some promising features like the upward facing camera. Maybe the next Anafi will be a serious competitor? We hope so! For those of you out there who are interested in an alternative: There are plenty of great alternatives out there. omnidirectional anti-collision sensors and leaves only small room for criticism.